Ngorika Children's Home provides a loving home environment for Kenyan boys orphaned by HIV/AIDS, providing for their physical, intellectual, emotional and spiritual needs to enable them to become godly men within their family, church, and community. 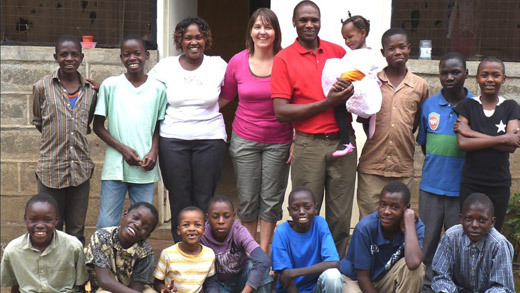 The Ngorika Children's Home in Nakuru, Kenya, was established by a Kenyan pastor and his wife, David and Peninah Njenga, in partnership with AIM missionaries. The Njengas care for HIV-negative boys who do not have immediate family able to care for them. The boys attend school and are involved in a local church. The boys currently range in age between ten and 17 years old. "Our desire is that this will be a large family held together by love rather than an institutional children's facility," says missionary Mark Buhler. Thanks to generous Canadian support, the home has been able to purchase land and livestock to produce and sell food. A well has also been drilled. How is Ngorika Children’s Home Unique? We have a lower ratio of children than many conventional children’s homes. We see Ngorika Children’s Home as more of a large extended family than an orphanage. The “parents” know the children personally and the children have many opportunities to observe what a Christian family is and what a Christian marriage is. We believe that it is only when these young people are transformed by the gospel and discipled in Biblical teaching that they will be able to stand up to the intense temptations they are faced with. We recognize their need for the foundation of a family environment in order for them to be future parents and leaders in their country. We teach them how to grow crops, care for farm animals, and many other valuable life skills for their future. We desire to see them become independent, contributing members of society, able to care for their own families rather than be dependent on handouts for the rest of their lives. Donors' gifts provide the boys with such things as education, health care, food, shelter, and clothing. Supporters of the Ngorika Children's Home are welcome to join a private blog for updates on Ngorika family life and prayer requests. Simply email a request to ngorikachildrenshome@gmail.com.